Since March of 1993, Many shows will come an go on a multitude of days and stations but Saturday will always be broadcast from 9-10am eastern time. Call in for live radio question 866 977 4820 during the broadcast on Saturday am. “ I was interested in doing the shows because, prevention plays such a large role in today’s eye care programs. I Feel we need to educate people about eye care to prevent needless eye damage and vision loss.” Proper nutrition plays a huge role on visual health as well as overall health. The purpose of these shows is to increase vision and nutritional health awareness in all age groups. 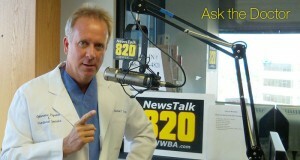 Dr. Michael Lange hosting popular live radio talk show “Ask the Doctor” on the latest in nutrition, anti aging and eye care. If you miss one of his programs you can call Fortifeye Vitamins at 866 503 9746 to find out what was discussed. Email Dr Lange directly at eyedude92@Icloud.com or watch all the videos of his talk show “ask the dr” on U Tube Ocular Health channel. Or if you would like to ask Dr. Lange a question via e-mail, fill in the form below and he will answer you as soon as possible.